When Dylann Roof, a self-radicalized domestic terrorist, walked into a Black church in Charleston, South Carolina and shot dead nine worshipers last year, it sent shockwaves through the Black community. For many Black people, the attack reminded them of the turbulent Civil Rights era, when acts of violence against Black churches were common. Some Black people say Roof’s attack forced them to reevaluate their attitudes towards firearms. Over the last few decades, most Black communities have taken an anti-gun stance as they became aware of the toll gun violence was taking on young Black men. But Roof’s attack made some people decide they need to start carrying weapons for their own protection. 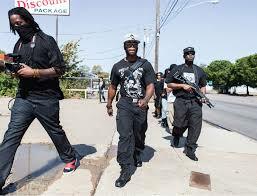 However, even today, there are Black gun clubs and self-defense groups who style themselves after the Black Panthers. One group, the Huey P. Newton Gun Club in Dallas, Texas, is named after one of the founders of the Black Panthers. Many of these gun clubs are motivated by individuals who believe in self protection, but also doubt that they can count on police to protect them against violent criminals. Vincent Hill, a gun owner and former law enforcement officer, said Roof’s attack touched him personally. Hill believes society has become so dangerous, that all citizens should be armed for their own protection. According to Hill, the main threat of gun violence comes from mentally ill people having access to firearms. Although Hill advocates more people carrying guns, he says that it’s important gun owners understand the responsibility of carrying a deadly weapon. The South Carolina shooting changed Phillip Singleton’s attitude toward gun ownership. Singleton feels that since violence can happen anywhere, people need to be prepared to protect themselves. After Roof’s massacre, Singleton said he thought about buying a gun and is currently going through the process of educating himself on how to handle firearms. “I have considered purchasing a gun in the last few months and have taken the necessary steps to learn how to properly handle, shoot and understand the local and state laws afforded to a concealed weapons holder,” said Singleton. But although he has begun training to learn how to use a weapon, he’s not sure he could actually pull the trigger if faced with a life-threatening situation. Like Hill, Singleton says the biggest cause of mass shootings is mentally unstable people having access to weapons. He said the government needs to do a better job of doing background screenings on potential gun owners. When Singleton decides to become a gun owner, he realizes that he will still have to closely follow the laws of his state. Although Roof’s massacre and the San Bernardino, California, terrorist attack may have sent Black people running for their weapons, owning a gun doesn’t always guarantee safety and protection. There have been some cases of Black people who have been killed, even though they were licensed gun owners. Corey Jones, a Florida musician, was killed by a police officer after his car broke down on the freeway even though he had a permit for his weapon. But Singleton says that scenario doesn’t intimidate him. Hill recommends that armed Black people quickly inform police they are carrying, to avoid any confusion. Hill acknowledges that race relations have gotten so bad, there may be more people like Roof who are willing to carry out violence on Black people. He pointed to supporters of Republican front-runner Donald Trump, who have attacked Black people who have protested his rallies. “Look no further than the man in N.C. who punches the Black protester then said on live TV ‘next time we’ll just kill them,’ ” he said. Singleton also says there may be people willing to inflict violence on the Black community, but there are also plenty of people willing to step forward and defend it too. “The Dylan Roofs of the world exist — but so do other Black men who are willing to take your life then claim self defense,” he said.